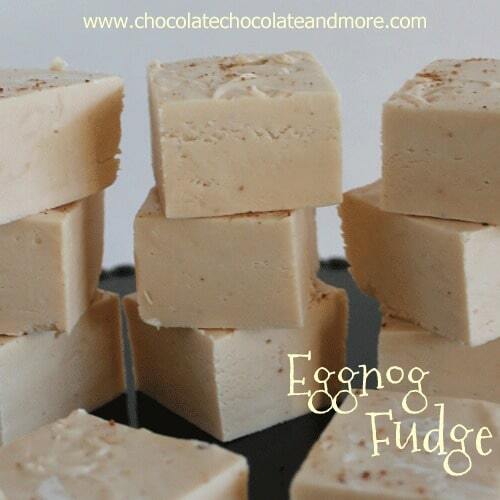 Eggnog Fudge - Chocolate Chocolate and More! 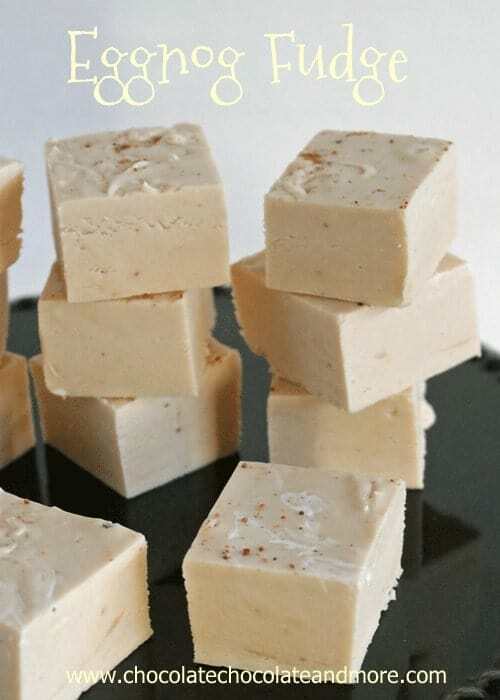 Eggnog Fudge-Smooth and creamy. A subtle eggnog flavor but not overwhelming, the perfect Christmas Fudge. I adore Eggnog. Creamy, thick, that eggy, sweet flavor. I just can’t get enough of it. As soon as I see it on the shelves, I start stocking up. I have no idea why grocery stores and really, dairies, torture me all year long. Only selling it for about 4 weeks out of the year. Usually it shows up the week before Thanksgiving, and then about the second week of December is the last shipment shipped to stores. And 2 of the kids love it as much as I do. I have to fight for every drop. Is it wrong of me to say I’m glad the hubby and the picky eater don’t like it? And why can’t you buy it by the gallon? My local grocery store only sells quarts. Common, really? I can’t walk into the house with just a few quarts of this heavenly nectar. I’f I go to the “big” store I can get a half gallon. I’m still buying 3 at a time. Don’t think this is a lot. Remember, it’s only half gallon jugs. When I buy milk, I buy 3 GALLONS at a time. If we have fresh, still warm out of the oven cookies, you can see close to a gallon disappear at that one sitting. There are 5 of us after all. And I know I can make my own eggnog but I haven’t found a recipe I like yet. So, since it’s eggnog season, and I can get my hands on it for the next few weeks, I’m taking full advantage. 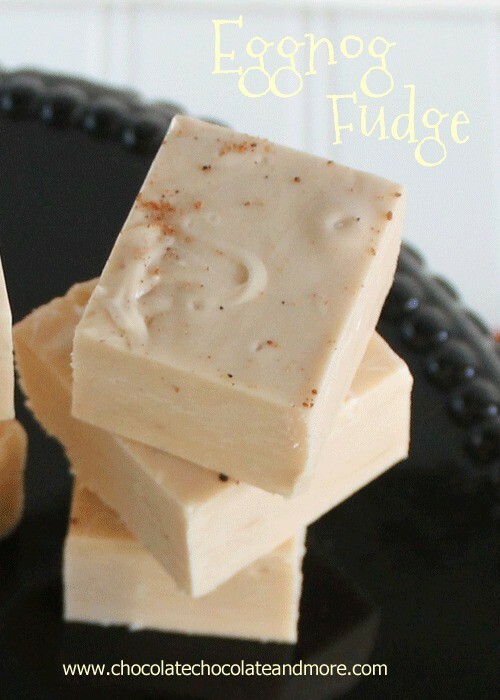 I’ve got a few treats you can make with eggnog and I’ll share them all but I wanted to start with this fudge. Smooth and creamy. A subtle eggnog flavor but not overwhelming. My picky eater loved it. Crap, now she likes eggnog too. Line a 9 x 9 pan ( 8 x 8 works too) with foil, then butter foil well. Set aside. Combine butter, eggnog, cream and sugar in a heavy medium saucepan. Bring to a boil over medium heat stirring occasionally Once boiling, reduce heat a bit and using a candy thermometer, continue cooking until temperature reaches 234 degrees (soft ball stage) remove from heat, stir in white chocolate. Continue stirring until chocolate is completely melted and blended in. Add in Marshmallow, nutmeg and vanilla. Stir till smooth. Spread into prepared pan. Garnish with a bit more nutmeg if desired. Let cool at room temperature completely before removing from pan and cutting into squares. Store at room temperature for up 2 a week or in refrigerator for up to 3 weeks. Oh my goodness! We’re crazy about eggnog here too (unfortunately ever last one of us)! This looks amazing, I will be making a batch as a surprise for my daughter, thanks! 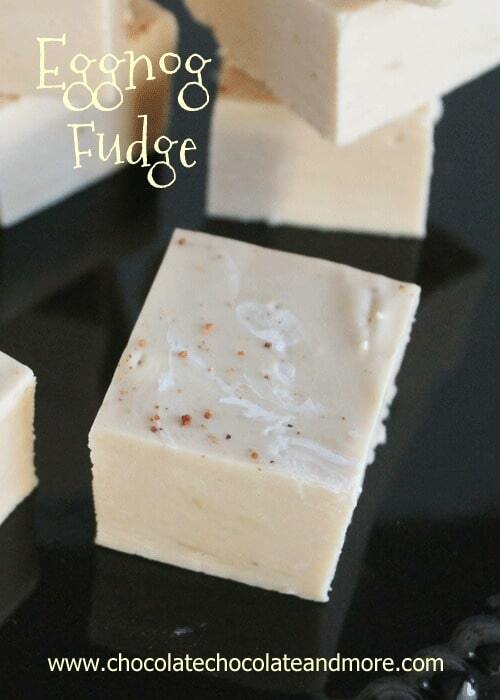 Yes the fudge might have tasted more like white chocolate than eggnog BUT THIS IS A FUDGE RECIPE!!! TOO RICH???? WHY ARE YOU EVEN LOOKING AT FUDGE RECIPES IF YOU CAN’T HANDLE RICH DESSERTS! FUDGEEE IS CONCENTRATED SUGAR!!!!! 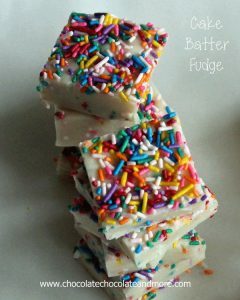 YOUR CRAZY IF YOU THINK FUDGE IS NOT GONA TURN OUT SUPER SWEET. NO ONE CARES THAT YOU DIDNT LIKE IT YOUR WASTING YOUR TIME POSTING THAT NONSENSE. ALL 6 PEOPLE THAT TRIED IT LOVED IT. THEY ALL COMMENTED THAT IT WAS GREAT EVEN WITH THE VERY SUTTLE HINT OF EGGNOG. Mel… for starters, there is no need to be so RUDE about other peoples’ comments. Everyone is entitled to their opinion (even RANTERS like you), and although 6 people may have made it and loved it, it’s obvious that some of us also made it and didn’t like it. Did you not stop to think that maybe a comment about a problem with the recipe, or a query about how it comes out, might actually be a platform for that issue to invite comments back that might be helpful and SOLVE it? Rather than a vitriolic outpouring of idiocy such as yours. Not all fudges are super sweet or super rich. You obviously haven’t been across the full board of recipes. I don’t feel that I’m “wasting my time” replying to you because you need a little educating. Which brings me to another point – try using a spell-checker or buy yourself a dictionary. I’m also disappointed by this fudge – all I can taste is white chocolate and it makes me sad. I know the feeling of having to have some delicious eggnog at this time of year! If you find a store that carries a gallon size, let me know:-) 3 gallons at a time is nothing!!! Gorgeous looking fudge Joan!!! I am SO IN LOVE with eggnog. I just bought my first bottle of it. MMMMM. Love this fudge – pinned and SO getting made. This has to be delicious if it’s made out of eggnog. This would be a great gift. I’ve never tried eggnog fudge before! Looks interesting. I’m saving this recipe just by looks alone! Nicely done! Too funny! I don’t blame how you think, though. If I love something that comes out in limited amounts, I’d be wishing I were the only fan at home, too. The fudge looks perfect! This only thing wrong with this is that you must put the eggnog into it and then there will be less to drink. I really, really, really like eggnog. Really. Eggnog and I have a weird relationship, but despite that, this fudge still looks amazing and I can only imagine how delectable that bite would taste! So sweet + delectable. Yum!! Lol Anita. So true! This looks so good. I’d love to have you link this us to Titus 2 Tuesday this week on Cornerstone Confessions.. I hope to see you there. I am not a fan of drinking eggnog, but love baking with it. I bet this fudge is delicious! Beautiful fudge, what a perfect gift for the holidays! Oh mah gawd. I’m literally drooling. Don’t tell anyone. What a stunning peice of art! This is super creative and love this for the holiday! Beautiful photos!!! Wow, my husband loves eggnog, so this would be a treat for him. Thanks for sharing! Joan, I can’t even handle the awesomeness of this. Really? You’ve done it again. I will be making this for my husband the eggnog addict! I’m absolutely delighted that you linked up yesterday at Mop It Up Monday! I’m featuring you over at The Tuesday Ten: http://www.ishouldbemoppingthefloor.com/2012/11/the-tuesday-ten_27.html. Have a fabulous week! OMG I am going to make this like right now! No Joking I have all the ingredients and I have to have a bite of that fudge! So Yummy! Oh Joan, I am so glad to hear someone likes eggnog as much as I do. I mean, I really, REALLY love it! 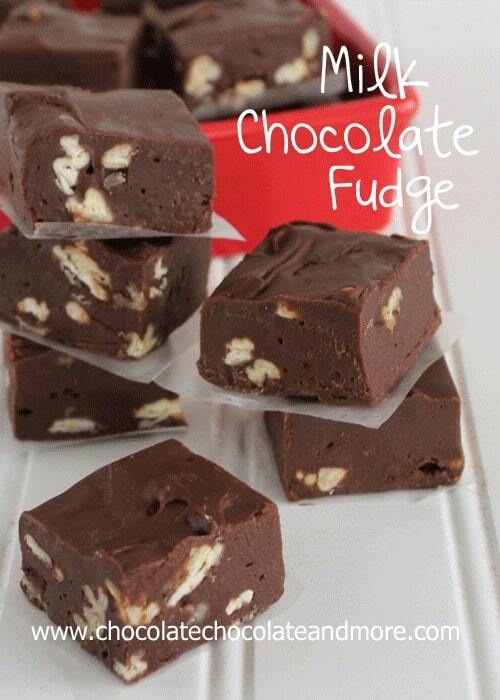 And this fudge is perfect in every way. Love! okay – it was the dusting of nutmeg that got me – that is my very favorite part of eggnog! That looks so delicious! I love the little sprinkle of nutmeg on top, yum! Yum!! I shared this on my facebook page! This sounds delicious! My fiance will love me forever if I make this for him. The man drinks his weight in eggnog every December. eggnog and Fudge! Are you kinding me! Yum! Please come share at my link party! This looks so good I had to try it! One question- as it’s cooling it has started bubbling around the edges. Is this normal for fudge (this is my first attempt making fudge or using a candy thermometer, so I’m nervous I skipped something) thanks! I don’t know about around the edges but I did have a few air bubbles. Gently tap your pan on the counter to let the air move to the top. What you might have been seeing was the butter melting from the foil, possibly? Let me know how it turns out. That looks delicious! Even my picky eater likes egg nog. =) Thanks for linking up to the Keep Calm and Link Up! Hope to see you back next week! Believe it or not I am not a fan of fudge, but yours looks so delicious I think I would try it! 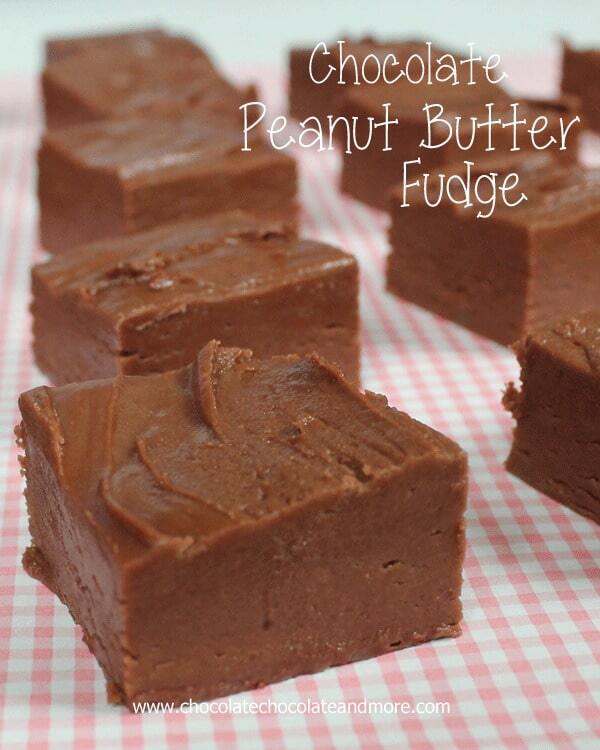 I have to try this fudge!! My family is not big on Egg nog, so more for me! I love nutmeg though. Eggnog by the gallon here too! With your picky eater liking eggnog — sounds like she is just discriminating and was waiting for the good stuff! The fudge sounds delicious. Thanks so much for sharing on Busy Monday! Turned out delicious! Popped the few bubbles and it evened itself out! Thanks! Love love love it – and pinned it! Oh my heck, this looks incredible!! I REALLY love eggnog! I’m featuring this on my Weekend Wonders round up tonight! Oh yum, quick question, can you make marshmallow` creme, I have never heard of it before. I just made this, and it is delicious! Can’t wait to cut into it when it cools. Will be featuring on my blog TheHillHangout.com next week, with a link back to you, of course. Thanks so much for the idea! So glad you enjoyed it. I’m making again this week for gifts! Costco sells eggnog by the gallon! Going to have to try this recipe it looks delish! If only we had a Costco near by. We have Sam’s but I try to avoid it, I spend way too much every time I go in there. Omg, Joan! This recipe rocks. I made it for my husband, but I really like it too!! Hi 🙂 I made this and it is so yummy!!! Mine does not look pretty like yours though. Oh how I wish I weren’t the only one in my household that enjoys eggnog. Then I’d have an excuse to make this more often! I know I’m 8 months later than everyone else but this is my first visit to your site. I like what I see so I’ll be back often. My husband is a huge eggnog fan and he doesn’t like the home-made stuff so I too have to buy it. My local stores only sell quarts so I by 10 – 15 every week while it is available and freeze it. We can have eggnog in this house right up to August or September.. I thaw it in the frige over night and shake it really well, it is just as good as the day I bought it. I hope this helps your eggnog cravings. Thanks for the great tip Deb, I’ll be sure to stock up this coming season! Could it be made using Boiled Custard instead of Egg Nog? Of course you can substitute Boiled Custard for the eggnog and it would be delicious! I’ve never had eggnog before but this looks so easy to make. May I know what brand to look for when looking for eggnog in the grocery. Thanks. Ela, I usually buy the store brand of egg nog that will be right near the fresh milk in the dairy section. So I have a question. The two cups of sugar, on top of the chocolate, marshmallow, AND the eggnog, seems like it would be cloyingly sweet. Is it? Is there a way to make this without so much sugar? Hi Breonna, it is Fudge so there is plenty of sugar but surprisingly, this is’t overly sweet. If you feel it’s necessary, you could reduce the sugar but 1/4 cup but I don’t think taste wise, it would make any difference. Eggnog and fudge!!!! What a perfectly delish combination!!!! Definitely making this. Thanks for the recipe!!!!! Is “eggnog” the same as Advocaat ? This recipe is very similar to the one on the marshmellow crème jar but they use evaporated milk can you use that instead of the heavy whipping crème? Hi Cheryl, your fudge will be denser but yes, you can use the evaporated milk instead of the heavy cream. Enjoy! I just made this for a party, a cousin who did not like eggnog (like myself) loved it. Although the look on her face when I told her it was eggnog fudge was priceless. My father in law loves eggnog and loves the fudge. Although my fudge came out a little darker in color than yours did. I am also having issues with my burner. I also used homemade Haitian vanilla which has a lot more spicy (like spices not hot) flavor to it. Thanks for the awesome recipe I am sure it will be a holiday favorite in the family. Don’t you just love proving people wrong about their food tastes! That Vanilla sounds wonderful and I’m sure added to the fabulous flavor! Hi 🙂 This fudge looks divine! I’m definitely going to try and make it. But is there anything I can replace Marshmallow Creme with? Or can I prepare it myself? Ami, you can certainly make it yourself. Brown Eyed baker has a wonderful recipe for it. Can you freeze this fudge ? You can. It’ll keep in the freezer for 1-2 months. Have you ever tried rum flavoring in this fudge ? I love eggnog & have it in the fridge all holiday season. I haven’t but I’m sure the rum flavoring would only enhance the eggnog flavor. If you try it, let me know! Hello! I live in South Korea and we cannot buy eggnog here. I make my own every year but it’s not quite as thick as regular eggnog one buys in a store. Any suggestions on preparing it? Should I use less? Also, thanks for the link to the homemade marshmallow creme! If your eggnog is more the thickness of milk (I know my homemade recipe is) I’d probably halve the eggnog in the recipe and use about 1/3 of a cup. I saw this posted on the “Confessions of Crafty Witches” Facebook page and thought YUM! Just made a double batch to send out to friends as Christmas presents. BUT – I licked the spoon once I was finished and it’s almost unbearably sweet (to my mind) with that amount of white chocolate. If the chocolate was halved, would it affect the consistency to any detriment? This is a sweet fudge. If you halve the chocolate you won’t have enough chocolate to help the fudge set up. And yes, you can use the alcoholic eggnog for this recipe and it’s yummy! And the booze will help cut some of the sweetness. And apologies for my less-than-polite reply to Mel’s comment, it just got my hackles up. Feel free to delete if you like. Your blog shouldn’t a place for such nonsense. I let my feelings get the better of me. Oh good grief, I forgot another thing I was going to ask! Would this work with the alcoholic eggnogs you can buy (I LOVE them! ), or would the alcohol affect the outcome? Thanks for any advice you can give me! This is a soft fudge but should be denser than frosting. Some eggnogs have more cream in them than others so are thicker, I just use the store brand in the diary section which is pretty thick but I know the Borden brands in the can is thinner. If your eggnog is not thick, I’d recommend cutting back on the eggnog by a tablespoon or two. The temperature on all candy recipes is for sea level. If you live at a different altitude, you need to adjust the temperature accordingly. Take the difference between the recipe temperature and 212 (temperature at which water boils at sea level). Then, find out what temperature water boils in your kitchen with your candy thermometer. Add the difference to the temperature at which water boils in your kitchen and you have the temperature to take your candy to. So I just made this, followed the recipe exactly and it was a complete bust. As soon as I added the white chips, it instantly became a crumbly dry mess. I continued to push through it and the creme helped to smooth it out a bit, but still nothing like smooth creamery fudge. Not sure what I did wrong. It tastes good but looks god awful! I’m so sorry you had trouble. It almost sounds as if possible some water (even just a few drops) got into your eggnog mixture and seized up your chocolate, water and chocolate are not friends. Could that be a possibility? Has anyone actually made this fudge? I made it tonight and altho the taste is amazing…it won’t set up!! HELP!!! Should I try putting it in the refrigerator or the freezer??? It tastes so amazing and I hate to waste this entire amazing batch. I’m sorry you’re having trouble with the recipe. You can definitely keep it in the fridge which will firm it up. What brand of eggnog did you use? Some are much thicker than others? I use the store brand in the 1/2 gallon container and it’s fairly thick. I know the Borden brand in the can is much thinner. i made this last night and found it too sweet without enough eggnog flavor. it’s a soft fudge but it did set up. after having a fail with another new fudge i found via pinterest i dragged out my candy thermometer. i started making fudge when i was i in college as gifts and got to where i could smell when it was ready to add the chocolate. but i’m having trouble finding the right balance with white chocolate recipes. You can make your own eggnog. That’s what everyone used to have to do. Bartenders would mix it up with egg and cream by the drink, unless they made a punch. Of course, that was before industrial agriculture put salmonella into the ovaries of hens so the store-bought eggs are unsafe. You can do what the dairies do and pasteurize the eggs before using them, or do what I do and keep hens and so have eggs you can eat raw without problem. Separate the eggs and beat the whites and you’ll have eggnog better than anything out of a carton. pag for a second time. Made this in a 9×13 glass pan and it was plenty thick. The fudge was rather dry and crumbly, but I am not sure if that is a factor of less butter and sugar than my normal recipe or of it being left uncovered for a night. The fudge stuck to the pan, but (again) I am not sure if this was due to less butter in the recipe or if I didn’t butter the pan enough. The white chocolate and the eggnog made a nice flavor combination, but it really didn’t hold a candle to the milk chocolate fudge I make every year. This was a good experiment, but I won’t be repeating the recipe since we need to be picky about where our calories in the dessert category come from. Thanks for the new idea though! I’m looking forward to trying this fudge recipe! I LOVE eggnog! Since its after the holidays, I’m going to make my own eggnog to use. this is the eggnog recipe I used the last time I made eggnog. it’s terrific! 1/3 cup whipping cream, 1 cup milk, 1 large egg, 1 tablespoon sugar, 1/4 teaspoon vanilla extract, and nutmeg to taste. mix using a hand blender, and lift it till the beaters are just below the surface (it makes a creamier eggnog). or just put it in a blender (the kind you make smoothies in) on high. I just came across this while looking for new eggnog leftover recipes. I love eggnog also and have had a hard time finding a recipe I liked as well. After a bit of tweaking from different recipes I finally came up with one I’m in love with! And I make it a gallon at a time hehehe. I also heat mine so that the grandkids can drink it because they love it also! I use 24 eggs and a cup of sugar. . Beat well (usually till its light and slightly frothy) 2 small cans of sweetened condeneed milk and (depending on how thic you like it will help determine milk amount I usually start with 2 cups) add 1/2 tea each nutmeg and all spice and 1 tea vanilla heat on med heat while whisking constantly. I usually heat to 160 while whisking for about 5 mins. Take off heat and let cool. Then I put in a clean gallon jug and add more milk till happy with consistency. I have tried it tempering the eggs with the hot milk mixture and it doesn’t have the same taste. It’s a lot of work but I think it’s worth it!